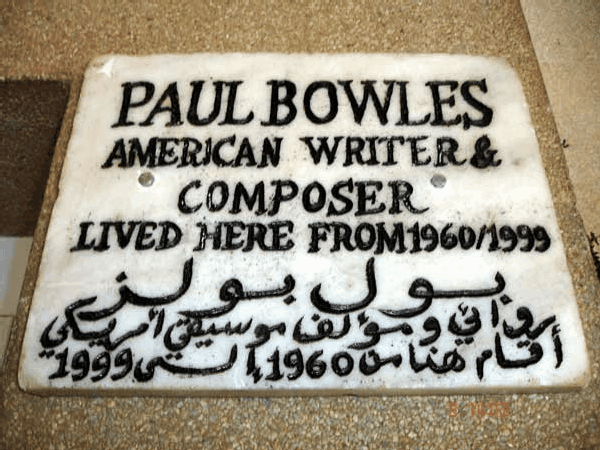 Of all of the expatriate writers who lived in Tangier, Paul Bowles was certainly the most famous and prolific, and he lived and worked a total of 52 years in the city. Tangier, Morocco is a Mediterranean port city located on the Strait of Gibraltar, with views of the southern coast of Spain. When Bowles left New York City in 1947 to write The Sheltering Sky, he had already been familiar with Tangier for sixteen years. On his first visit to Tangier in August 1931, Bowles was accompanied by his music teacher and friend the composer Aaron Copland. Their upright piano had fallen off a donkey during its transport up to the Old Mountain to the house which they had rented in Sidi Masmoudi, but the piano was soon repaired but badly tuned, and they settled down to write music in earnest. 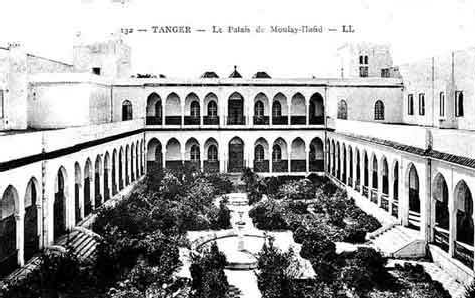 Gertrude Stein, who Bowles had associated with in Paris, recommended he try Tangier as a place to live and work. Paul Bowles described that earlier Tangier as an "attractive, quiet town of about 60,000 inhabitants". In January 1948, his wife Jane Bowles, also a writer, moved to Tangier to be with her husband who had just bought a small house in the upper Medina. Paul Bowles remained in Tangier until his death on November 18, 1999, at the age of 88. Paul Bowles explored all regions of Morocco, including the Sahara, and he learned much about Moroccan culture, languages and dialects, religions, customs and its people―all reflected in his writings. 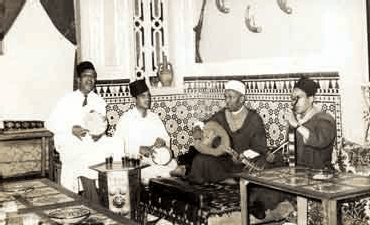 Beginning in 1959, Bowles began to collect and record Moroccan folk music in remote areas of the country. This music is preserved in the Paul Bowles Moroccan Music Collection at the Library of Congress in Washington. Before he died, Bowles decided to be buried in his native America, in upstate New York, next to the graves of his parents and grandparents. Yet Paul Bowles will always be associated with Tangier and Morocco. Untold visitors have made pilgrimages to Tangier to meet him, perhaps inspired by reading some of his novels or short stories; and after his death most guide books for tourists mention something about Bowles's association with Morocco and his literary works. 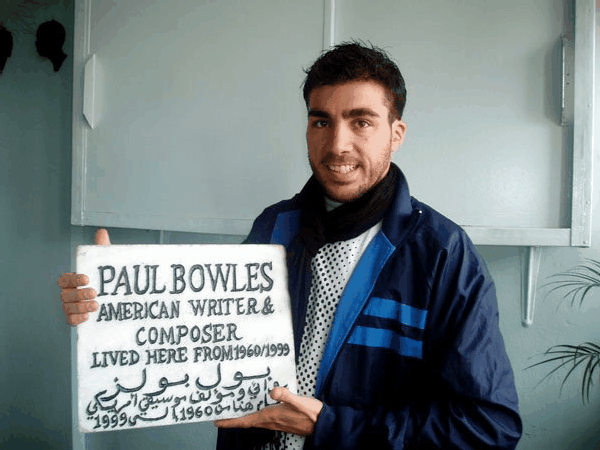 Today there is a Paul Bowles Wing in the historic Tangier American Legation Institute for Moroccan Studies (TALIM), which is open to the public free of charge. Tangier, with its mild, subtropical climate and superb beaches, eventually grew into a popular summer resort and now has more than one million people. Paul Bowles's residence encompassed the last French colonial years, the International Zone period, when the city was under multinational rule, and the subsequent era of Moroccan Independence which began in 1956. This travel piece entitled "The Worlds of Tangier" was written in 1958―one of many travel articles he wrote during his exceptional life. A week later I was aboard a little ship called the Iméréthie II bound for various North African ports, and ever since I have been grateful to Gertrude Stein for her intelligent suggestion. Beginning with the first day and continuing through all the years I have spent in Tangier, I have loved the white city that sits astride its hills, looking out across the Strait of Gibraltar to the mountains of Andalucía. In those days Tangier was an attractive, quiet town with about 60,000 inhabitants. The Medina looked ancient, its passageways were full of people in bright outlandish costumes, and each street leading to the outskirts was bordered by walls of cane, prickly pear and high-growing geranium. Today, where this thick vegetation grew, are the cracking façades of new apartment houses; the Moslems have discarded their frogged Oriental jackets and enormous trousers of turquoise, orange, pistachio or shocking pink, to don Levis, and secondhand raincoats imported by the bale from America; the population has augmented at least threefold, and I’m afraid the city would never strike a casual visitor as either quiet or attractive. There must be few places in the world which have altered visually to such an extent in the past quarter of a century. A town, like a person, almost ceases to have a face once you know it intimately, and visual modifications are skin-deep; the character is determined largely by its inhabitants, and a good deal of time is required to change their attitudes and behavior. Tangier can still be a fascinating place for the outsider who has the time and inclination to get acquainted with its people. The foreigner who lives here on a long-term basis will still find most of the elements which endeared the place to him in the old days, because he knows where to look for them. Tangier is still a small town in the sense that you literally cannot walk along a principal street without meeting a dozen of your friends with whom you must stop and chat. What starts out to be a ten-minute stroll will normally take an hour or more. 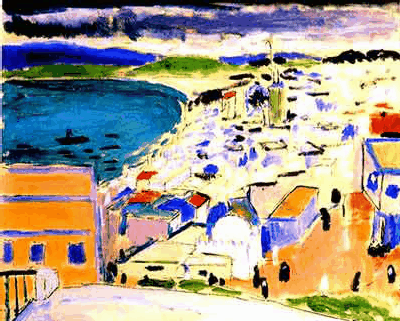 In 1912–13, the French artist Henri Matisse lived in Tangier, in room 35 at the the Grand Hôtel Villa de France, and he painted various scenes and people. This famous hotel near the Place de France, with its gardens, palms, bougainvillea, swimming pool and sea views, abruptly closed in 1992 and languished, gutted, for seventeen years. In 2003, the Municipality of Tanger designated the building and site as a historic landmark, and in 2009 the hotel underwent a three-year restoration, renovation and expansion. The Grand Hôtel Villa de France reopened in late-June 2014 as a 5-star luxury establishment, with the Matisse Room preserved as a mini-museum. You will run into a Polish refugee who arrived ten years ago without a penny, borrowed enough to become a peanut vendor, and today runs a prosperous delicatessen and liquor store; an American construction worker who came to Morocco to help build the United States air bases, and has since become a freelance journalist; a Moslem who spent who years in a Spanish jail for voicing his opinions on Generalissimo Franco, and now is a clerk in the municipal administration offices; a tailor from Rome who has not amassed the fortune he had counted on and wants to go home; an English masseuse who was passing through Tangier twenty years ago on a holiday trip and somehow has never left; a Belgian architect who also runs the principal bookshop; a Moslem who taught in the University of Prague for seventeen years and now gives private Arabic lessons; a Swiss businessman who likes the climate and has started a restaurant and bar for his own amusement; an Indian prince who does accounting for an American firm; the Portuguese seamstress who makes your shirts; and in addition you will be hailed by a good many Spaniards, most of whom were born in Tangier and have never lived anywhere else. The Moslems account for roughly 70 percent of the population; they still sit in their tiny cafés, drinking tea and coffee, playing cards, checkers and dominoes, shouting above the din of Egyptian music on the radio. Nothing has really changed here either. Although the people who love Tangier sometimes feel as though there were a conspiracy afoot to make it the most hideous place on earth, actually such a project would prove extremely difficult. With the exception of a few corners of the Medina, where the old Moorish architecture has not yet been improved upon, there is nothing left to spoil. And even when the veil has been removed from the face of the last woman to wear one, so she can do her shopping sporting a rayon-satin evening gown four sizes too large for her, and the final old house with a fortresslike façade and one great studded door is demolished to make room for a six-family concrete dwelling with fluorescent lighting in every room, the town will still look very much the same. With everything old being systematically destroyed (and the new European buildings are almost without exception eyesores, while the ones the Moroccans put up are even worse), how is it that Tangier escapes becoming an aesthetic nightmare? Its topography, more than anything else, I think, saves it; the city is built along the crests and down the flanks of a series of small hills that stand between the sea on one side and a low slightly undulating plain on the other, with high mountains beyond. There are few level stretches in town; at the end of each street there is almost always a natural view, so that the eye automatically skims over that which is near at hand to dwell on a vignette of harbor with ships, or mountain ranges, or sea with distant coastline. Then, the intensity of the sky, even when cloudy, is such that wherever one happens to be, the buildings serve only as an unnoticed frame for the natural beauty beyond. You don’t look at the city; you look out of it. The back streets of the Medina, crooked, sometimes leading through short tunnels beneath the houses, sometimes up long flights of stairs, lend themselves to solitary speculative walks. With nothing more dangerous than pedestrians and an occasional burro to worry about bumping into you, you can devote part of your mind to coming to grips with your ideas. Since I returned here in 1947 I have spent a good many hours wandering through these passageways (incidentally learning to distinguish the thoroughfares from the impasses), busily trying to determine the relationship between Tangier and myself. If you don’t know why you like a thing, it is usually worth your while to attempt to find out. 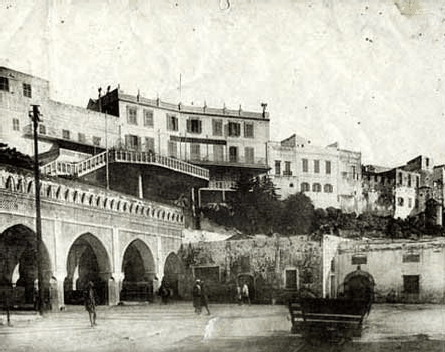 An old photograph showing the interior courtyard of le Palais Moulay Hafid (Palazzo Delle Istituzioni Italiane), the location of Casa d'Italia, a popular Italian restaurant in Tangier. I have not discovered very much, but at least I am now convinced that Tangier is a place where the past and the present exist simultaneously in proportionate degree, where a very much alive today is given an added depth of reality by the presence of an equally alive yesterday. In Europe, it seems to me, the past is largely fictitious; to be aware of it one must have previous knowledge of it. 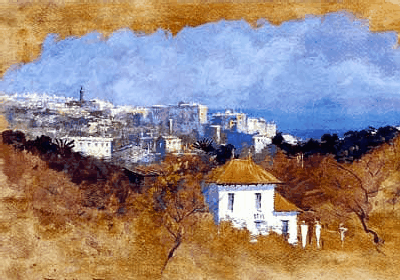 In Tangier the past is a physical reality as perceptible as the sunlight. Tangier is little more than an enormous market. Since the war it has been primarily a free-money market; and the new autonomous Moroccan government will probably take an increasingly active part in the economic life of a city without currency control. 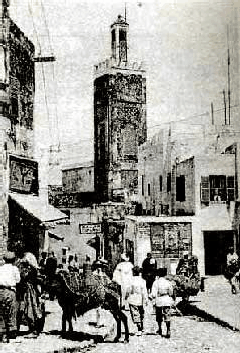 During the international years the dramatic, extralegal facets of the city’s character were much publicized, and Tangier was thought of as a place where every fourth person was a smuggler, a spy or a refugee from justice in his native land. It is true that the city was a market where diplomatic information was bought and sold; it was also a place where goods destined to pass eventually across frontiers without benefit of customs inspection were unloaded and reloaded, and, more importantly, a place where people from a variety of nations were able to exist without valid documents to identify them. Then, too, in the absence of all taxes, it was expedient for European exporters to maintain offices here, even though their produce might never pass within a thousand miles of the Moroccan coast. That era is over; such unregulated freedom could hardly continue indefinitely. The withdrawal of foreign business has produced a slump, and there is an unhealthy amount of unemployment. The shops are stocked with a superfluity of assorted goods from everywhere, and there are not many buyers. The city has no industry—only shopkeepers, agents, hawkers and touts. Advertisements for watches are ever-present. They flash on and off in the shop windows and flare in neon above the sidewalks. There is an enormous watch sign on a roof at the lower end of the Zoco Chico, in the heart of the Medina’s principal thoroughfare, made entirely of large sequins, ceaselessly fluttering and glittering above the crowd. All this in a place where for the great majority the smallest unit of time measurement is the qsim, which is equal to five of our minutes! But Tangier is very time conscious these days; the youngest children often stop you to inquire gravely what time it is, and listen with obvious relish to your mysterious answer. Another inescapable feature of the streets is the ubiquitous cambio, with its slate bearing the buying and selling rates, in pesetas, of all the world’s principal currencies, including the gold dollar. The rates are scribbled in chalk and are subject to change at any moment. The less elaborate cambios consist of a chair and a box placed on the sidewalk; the upper end of the Calle Siaghines is lined on both sides with these primitive offices. Personally I have always found that I save money by using a bank. People here have a fondness for describing Tangier as “central,” by which they mean that it is two and a half hours from Gibraltar by ferry, five hours by London by plane, seven hours from Casablanca by car (if you’re a careful driver), three days from the beginning of the Sahara Desert by train (assuming there is no sabotage on the line during your journey), and six days from New York by ship. Although the inhabitants of northern Europe consider it a winter resort, those who live here, no doubt having been spoiled by its excellent climate during the rest of the year, often try to escape at that time, because of the torrential rains that come blowing in, usually from the Mediterranean. It is not cold, but it is decidedly wet, and if you can find sun by going a few hundred miles southward, it seems foolish not to go. The heavy rains can come at any time from December to April; while you may have many weeks of crystalline skies in the course of that period, you can be sure of getting the rains sooner or later, just as you can count on fine weather from the beginning of July onward into November. I often wonder what the climate was like here twenty-five centuries ago, when the place was a trading port called Tingis, run by the Carthaginians up from the coast, and Morocco was a region of dense forests where herds of elephants wandered. I wonder specifically whether the winters could have been any wetter than they are now; I suppose the answer is that they were, but it’s difficult to believe. The basic character of Tangier actually has changed less definitively than its climate. From the beginnings of its known history it has always been in touch with the outside world; its affairs have been administered either directly by representatives of foreign powers or by Moroccans acting in the interests of such powers. For a long time after the fall of Carthage it was a Roman colony; then it was occupied successively by the Vandals, the Byzantines, the Visigoths, the Arabs (who fought over it almost constantly among themselves and with the Islamized Moroccans for eight long centuries), the Portuguese, the Spanish, the Moroccans themselves, eventually with French guidance, and finally the powers represented by the International Commission, of which the three favored members were France, England and Spain. (During World War II Franco, betting on an Axis victory, grabbed it, but was forced to relinquish it to the International Commission at the war’s end.) At the moment it is governed by the King of Morocco and militarily occupied by troops of the Moroccan Army. La Place de la Kasbah is the location of the Sultan's Palace Museum (Palais Dar al-Makhzen or Musée de la Kasbah), which is open during weekdays from 9:30 AM to 4:30 PM; the entrance fee is 10 Dirhams. There are regular exhibitions of art works and paintings, and Roman archaeological artifacts are on exhibition as well as historical information on Tangier. La Place de la Kasbah has an upscale boutique and next door is a small Moroccan musicians' café where you may enjoy a traditional mint tea. From here one may stroll the narrow alley-like streets, or walk through an arched gate to view the old port of Tangier and the city's large palm-lined crescent-shaped beach down below, or view the Strait of Gibraltar. On a clear day you can see the beaches on the coast of Spain and the windsurfing town of Tarifa―the southernmost point of continental Europe. You can easily get to Tangier from Tarifa, Spain by hydrofoil in just 35 minutes. For years I have been “showing” visitors Tangier. Being an amateur guide in a town that has so many professional ones has its disadvantages, even conceivably its hazards, and in itself is not a particularly enjoyable pastime. But for the nine sight-seers who are mildly amused by the chaos and absurdity of the place, frankly repelled by its ugliness and squalor, or simply indifferent to whatever it may have to offer, there is a tenth one who straightway falls in love with it, and that is the one, of course, who makes the tedious game worthwhile. For this one, as for me, a blank wall at the end of a blind alley suggests mystery, just as being in the tiny closet-like rooms of a Moslem house in the Medina evokes the magic of early childhood games, or as the sudden call to prayer of the muezzin from his minaret is a song whose music completely transforms the moment. Such reactions, I have been told, are those of a person who refuses to grow up. If that is so, it is all right with me, to whom being childlike implies having retained the full use of the imagination. For imagination is essential for the enjoyment of a place like Tangier, where the details that meet the eye are not what they seem, but so many points of reference for a whole secret system of overlapping but wildly divergent worlds in the complex life of the city. What do I show these visitors? Not very much, I’m afraid. Aside from the so-called Sultan’s Palace, an 18th Century construction which now houses a small museum, there are no “points of interest” or historic monuments. 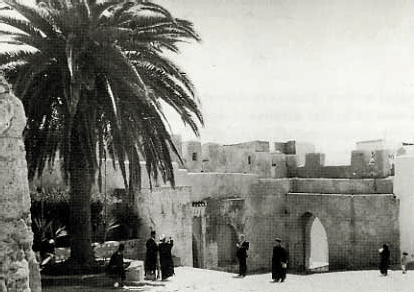 In my capacity of cicerone, I have never taken anyone to the Sultan’s Palace, because it is not very interesting; it is almost impossible for the visitor to escape it in any case, since every child in the Casbah has one fixed purpose in life, to guide the steps of as many tourists as possible to its entrance door. Sometimes visitors have wanted me to see what they quaintly imagined was called “the red-light district,” which consisted of a few back streets on either side of the Zoco Chico. I always let the guides take care of that; anyway, the excursions were invariably unsuccessful, the visitors being bitterly disappointed to find that the Moslem establishments were strictly closed to all but those of the Faith. I use the past tense because, since the coming of independence to Morocco, all brothels have been closed, no matter what the faith of their inmates or prospective clients. I show visitors the Zoco Chico, whose European-style cafés close these days shortly after midnight. The era is gone when they were open all night, and you could stop by at five in the morning for coffee and watch the tired tanguistas from the night clubs being escorted homeward by their pomaded chulos. Now the Zoco Chico is a serious and early affair where the customers, mostly Moslems, sit discussing politics over soft drinks and watch, or take part in, the frequent fights that occur n the middle of the square—struggles which break out between the police and unofficial political neighborhood constables, generally over the question of who is to have custody of stray Moslems suspected of having drunk alcohol. Although it is rumored that spirits will be eventually prohibited in this part of the city, there are still plenty of bodegas and bars open for business; and as far as the Moslems are concerned, it is safer for them if they simply pretend these establishments don’t exist. The Zoco Chico used to be completely surrounded by sidewalk cafés; slowly these are giving way to curio shops run by members of the ever-increasing colony of Indian merchants, so that now the little square has only five left. Non-Spanish Europeans and Americans patronize the Café Central, probably because it is the largest and brightest. It is also the most consistently besieged by shoeshine boys, beggars, lottery-ticket sellers and wisecracking Moroccan youths trying to force you to buy toothbrushes, toys, fountain pens, fans, razor blades and rayon scarves; so that if you want a quiet conversation, or a half hour with your newspaper over a cup of coffee, it is better to go elsewhere. 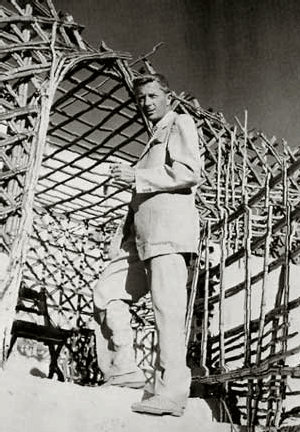 Paul Bowles at his house on rue Sidi Bouknadel, Kasbah, Tangier, 1954. Over the years, I have seen the most unlikely people sitting among the djellabas and fezzes at the Café Central, from Barbara Hutton to Somerset Maugham and Truman Capote and Cecil Beaton. The other day when I walked past, Errol Flynn was there trying to hide his face behind the pages of a newspaper while a group of Spanish girls stared from what they considered a respectful distance of three feet. Miss Hutton’s presence in the Zoco Chico is accounted for by the fact that she is a sometime resident of Tangier, her house being in the Medina just around the corner from my own. An important difference between our respective dwellings should be pointed out, however. Hers, I am told, consisted originally of twenty-eight separate Moslem houses which were pulled apart and put together again to make the present structure; mine is still what it always was: a very small and uncomfortable shoe box stood on end. The true center of Tangier is the Zoco de Fuera, an open-air market where the Moslems sell everything from parakeets to buttermilk, from Berber blankets to hot roasted chestnuts, from sofa cushions to Japanese dolls. Eighty years ago the traveler who arrived in Tangier after sunset spent the night here at the foot of the city walls, waiting for the gates to be opened the next morning at dawn. Today the Zoco is a very large square just outside the southern ramparts of the Medina—by day a sea of buses, taxis, milling pedestrians and vociferous peddlers. In the middle of this sea is an island which, over the quarter of a century during which I have known it, has grown consistently smaller and less shady as piece after piece of it has been sacrificed to make room for the increasing motor traffic. Storytellers, musicians, acrobats and assorted entertainers used to hold forth here under the trees; in recent years there has grown up a miniature village of rickety little wooden structures with narrow passageways between them. If you don’t mind being caught in the crush of Moslems from the country, you can squeeze in and wander through, watching them bargain for big disks of bread and pats of goat cheese. The two wider streets of this island are given over to the display of flowers, incense and cosmetic ingredients such as lumps of alum, henna leaves, shampooing clay and sulphide of antimony for eye make-up. The Hôtel Continental is located in Tangier's Medina at 36, rue Dar Baroud, and it overlooks the downtown port and the ocean. This historic hotel first opened its doors in 1870. Edward, Prince of Wales, who later became King Edward VII after the death of his mother Queen Victoria, stayed at the hotel in 1888. There is never a moment of the day when the square and the arteries leading into it are not jammed with thousands of voluble vendors and their prospective customers. Late at night, however, a lone voice will echo across its empty darkness, and you can hear, coming from the little wooden stalls, the snores of the watchmen or of the proprietors themselves as they sleep curled up on top of their wares. Before daybreak the long caravans of Berbers and their donkeys which have been moving on their way all night along the country roads toward the city will have arrived, and the goods, mainly foodstuffs, will have been unpacked in one of the big courtyards near the Zoco. The sun will rise on the same scene on which it set the evening before; if it is a Thursday or Sunday there will be even more people from the hills roundabout, for those two days are specifically market days. The old European residents of the town love the Zoco passionately, and have in the past fought successfully against all plans for modernizing it, cleaning it up, or making a parking lot or a public part out of it. Now that the Moroccans have the power to decide what is to become of it, it is anyone’s guess how long it will last, this lively oasis of the past in the midst of today’s dreariness. I suspect that it will not disappear before the people who run it are willing to have it go, and since fortunately they are not too interested in change for change’s sake—unlike the city Moslems, who have been infected with the progress virus—the din, smoke and brilliant confusion of the Zoco may remain in our midst a little longer. 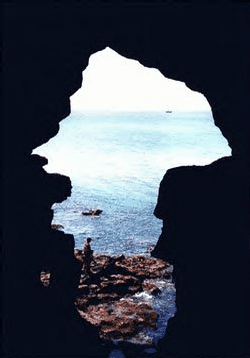 The Caves of Hercules (les Grottes d'Hercules) at Achakar are several miles outside the city limits of Tangier, Morocco, on the Atlantic side. Nearby is Le Mirage, a small, luxurious hotel directly overlooking the ocean, and where Paul Bowles enjoyed the views and food in its elegant dining room. White sand beaches nearby include Mediouna, Bakassem, Jbila and Sidi Kacem. Usually I take my wards to see the beaches and the Mountain. For those who prefer company while they bathe there is the municipal beach, a fine five-mile semicircle of sand bordering the Bay of Tangier, and within walking distance of all the hotels; for lovers of solitude there is the vast Atlantic beach stretching southward from the Grottoes of Hercules in a straight white band as far as the eye can see, across the Oued Tahardatz and on into what used to be the Spanish Zone. This is utterly unspoiled and one of the most beautiful beaches I know. 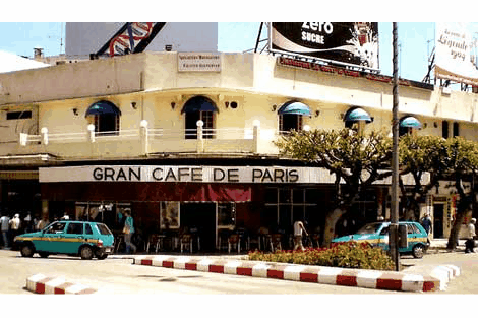 The Mountain, the highest point on which is about a thousand feet above the port, is heavily forested with eucalyptus, parasol pine and cypress, and is considered the pleasantest place in all Tangier to live. Three hundred years ago these forest lands served as a base of operations for the Moroccans in the unsuccessful war to liberate Tangier from the British. Today, however, the British have got a good part of them back again, for it is largely they who own land and live on the Mountain. There are also the palaces of two defunct sultans: the palace of Ben Arafa, who was not a sultan but had to play the part of one when the French exiled the present monarch in 1953; and the romantically isolated Villa Perdicaris, looking like something out of Sir Walter Scott, which was bought by the Pasha el Glaoui not long before that unpopular notable’s death in 1956. During the summer of 1957 it was announced officially that His Highness Mohammed V intends to make Tangier his summer capital. Whether this will actually happen remains to be seen, but many people here, convinced that this would provide a solution to the local economic crisis, are holding their breath in hope that the rumor will turn out to be true. My own suspicion is that the soaring prices which would result would mean the end of Tangier as one of the cheapest places for an American to live in, whatever miracles it might perform for the town’s economy. When the visitor has seen the Zocos and beaches and palaces, he still has not seen the city’s most important single phenomenon, the one which gives reality to and determines the ultimate meaning of all the others: I mean the spectacle of the average Moroccan’s daily life. This necessitates going into the homes, preferably those of the lower middle class, and into the small neighborhood cafés which have a strictly Moslem clientele. The cafés are not as easily accessible as they used to be, since the recent upsurge of nationalist feeling has somewhat modified the attitude of amicable indifference which the Moslem used to show toward the anonymous foreigner. For this reason it is important for me to choose places where my face is known, where I can still get a jovial greeting from the proprietor and thus be assured a reasonably friendly reception on the part of the patrons. In the back of practically every such establishment there is an open space covered with reed matting, generally raised above the level of the floor; entry into this part of the room demands the removal of one’s shoes. Here the men sit with their legs tucked under them and, more often than not, in spite of the unofficial prohibition, pull out their kif pipes and smoke them as they always have done. The cafés are like men’s clubs. A man frequents the same on year in and year out. Often he brings his food and eats there; sometimes he stretches out on the matting and sleeps there. His café is his mail address, and rather than use his home, where there are always womenfolk about, he will use the café for keeping his social appointments. In the smaller cafés, the entrance of anyone from outside the familiar circle of daily habitués has always been regarded with a wary eye and a certain degree of suspicion. Each café has its own little legends and references which can be understood only by the initiates. It is here that the endless stories and complicated jokes which so delight the Moslem mind are told, and where the average man is at his happiest and least inhibited. If a café happens to offer any kind of native Moroccan music, which is extremely rare these days, I will force my way through any wall of hostile stares in order to get a seat and listen; I suppose not many visitors are that eager to hear Moroccan café music. The casual outsider, however, can usually get more glimpses of café life than he can of home life. In a bourgeois household, upon the entry of any man or boy not of the immediate family, Moslem or otherwise, all the women and girls are swiftly hidden, and remain hidden until he goes out of the house. In families of lower income, on the other hand, the social strictures have been considerably relaxed, so that I have only to suggest to my maid or chauffeur that a group of my friends would like to visit a Moslem home and meet all the members of the family, and the invitation will be willingly extended. I don’t claim that the activities which we see in a Moslem house are identical with those which would be going on if we were not there. But if we stay long enough, a certain degree of relaxation is usually reached, and the household rhythm at length begins to pulse of its own accord, so that it is possible to get a pretty clear picture of what life is like in the domestic citadel. By our standards these people are desperately poor. At present, for instance, the maid who gets our breakfast, cleans the five rooms, and does all the laundering of our clothes, earns the equivalent of $8.33 a month. Also, she gets no food from us. Even in Tangier that is a low wage for 1958. Yet if you visit her house, you find it immaculate; moreover, the manner of life that she and her family lead manages to give an impression of Oriental ease and even abundance. It is a peculiarly Moslem gift, being able to create the illusion of luxury in the midst of poverty, and it never fails to arouse my admiration when I see it displayed. But then, these people are the supreme illusionists; they can give a straightforward action the air of being a conjurer’s trick or make the most tortuously devious behavior seem like naturalness itself. I have never decided precisely why the time spent in these humble homes is so satisfying. Perhaps it is merely because both hosts and guests are playing a simple, pleasant game in which the hosts lead the way with regard to the silences to be observed as well as the conversation to be made, and the guests follow comfortably, happy to have all social responsibility taken from them. Certainly it is agreeable now and then to spend an evening reclining peaceably among piles of cushions, in effortless talk with people who are completely natural but infinitely polite. And when the end of the evening comes, and they have fully convinced you that the occasion has been even more enjoyable for them than for you, and you have pronounced the necessary formulas of farewell, it is delightful, too, to step out into the silent moonlit street, and a moment later look from a Casbah gateway down upon the thousands of white cubes which are the houses of the Medina, hearing only the waves as they break on the beach and perhaps the sleepy antiphonal crowing of two roosters on neighboring rooftops. If I ask myself occasionally whether I may not be a trifle out of my mind to have chosen to spend so many years in this crazy city, it is at such moments that I am reassured—easily able to convince myself that if it were 1931 once more, and I possessed the gift of accurately foretelling the future, I should very likely take Miss Stein’s good advice and make my first journey to Tangier all over again. When in Tangier, don't miss the new Paul Bowles Wing in the Tangier American Legation Institute for Moroccan Studies (TALIM) a museum located in the medina, near the Petit Socco, where photographs, portraits, memorabilia, books and other items related to Paul Bowles and Tangier are on exhibition. You may also purchase books by Paul Bowles and other authors in English, Spanish and French, and Moroccan souvenirs. The museum is open Monday through Friday from 9 AM until 5 PM., and there is no charge for admission. The Tangier, Morocco links page provides information on Moroccan news media, airline and ferry boat services, cultural, travel agency, hotels and guesthouses resources and links on the bottom half of the page. Samir Mechbal holds the marble plaque, inscribed in both English and in Arabic, which he installed in early 2009 on the apartment building where Bowles lived for nearly four decades, from 1960 until his death in late 1999. Samir, who had lived in the building before moving to Spain, where he works in the film industry, felt that a plaque honoring Tangier, Morocco's most famous expatriate resident would be a fitting tribute and memorial.